We all love jeans, but when the workplace requires pants that look more like slacks -- or you simply want to add some variety to your workwear lineup, put these Wrangler Workwear Men's Navy WP80 NV Canvas Cargo Work Pants in your rotation. They're made to work i ... (see full details) (see specifications) #WRGWP80NV. We all love jeans, but when the workplace requires pants that look more like slacks -- or you simply want to add some variety to your workwear lineup, put these Wrangler Workwear Men's Navy WP80 NV Canvas Cargo Work Pants in your rotation. They're tough, too, thanks to the durable canvas weave, double-needle stitching, and reinforced front pockets. For a fabulous fit, they're made with a slightly lower rise than traditional work pants, creating a contemporary look. Darts above the hip pockets help provide a better fit. And for freedom of movement, these workday staples feature a gusset at the inseam. The extra fabric helps more freedom of movement for bending, stooping, and stretching -- because while it might be nice to stand still once in a while, Wrangler knows that's not how you spend your days. For functionality, these pants feature plenty of pockets. The front pockets are extra deep at 13 inches and reinforced to stand up to those keys. Back pockets are set in and the left one closes with a button. Two cargo pockets feature bellows styling for added storage, plus exterior utility pockets that close with snaps. In navy blue, these pants will look great with just about any color top. For durable, soil resistant, wrinkle-resistant pants that are easy to care for, choose these Wrangler Workwear Men's Navy WP80 NV Canvas Cargo Work Pants. Buy today at Working Person's Store! I didn't like the way these pants looked or felt. I have returned them for credit. I am a welder and the pockets were too big on the side. The material was not like the canvas pants I have had before. Might work for some but wasn't for me. Great pair of pants. Fit great and feel comfortable.Will be getting more pairs soon. 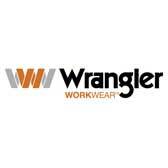 Wrangler Workwear Pants: Men's Navy WP80 NV Canvas Cargo Work Pants is being added to your cart.